Susan had the best idea for a Question of the Week about what we save on and what we splurge on when it comes to fitness. And, so far, the results have been super interesting! Susan invests in the comfort items but not a super crazy high-end bike, while Kristen spends more on gear and experiences and not gym fees. And me? Well, I have my own take — which just goes to show you that when it comes to health and fitness, there are about a million ways to do it and the only way that matters is the way that works for you! So, behold my fitness budget! General workout apparel: Like, Kristen, I am lucky that I get a lot of goodies in the mail to review and, because I got them all sweaty and gross when testing them, I get to keep them. Which is cool. But what’s also cool is that I know from experience the true difference between super-duper affordable and way pricey. And generally, when it comes to what I’ll spend my money on for my regular workouts (note: running apparel is down below), I choose to save. I hit sales at Old Navy and Target — and a lot of my favorite workout Ts and tanks are actually from either our store or my gym the Fit Pit! Home workouts: I work out at the gym three times a week (more on that in a sec), but for all other workouts, I do them at home for pretty much free. There’s no cost to go for a good run or walk around the neighborhood or at a local park, and I’ve been known to fire up a free workout app or a free YouTube video to get a good sweat on. Not to mention that I also enjoy creating my own workout circuits from time to time to do at home! Grocery staples: There are a few things I buy almost every time I’m at the grocery store. Things like organic spinach, nut butter, almond milk, dark chocolate, eggs, etc. For these things, I hit up my three favorite places to get the healthy basics at a really, really good price: ALDI, Trader Joe’s and Costco. 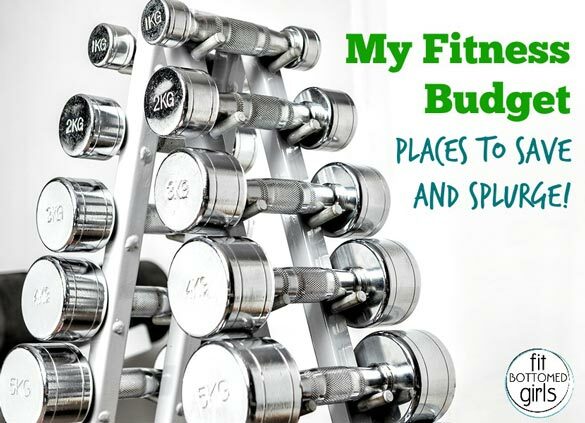 Most fitness equipment: Besides a resistance band, some dumbbells and a TRX I’ve had since basically FBG’s inception, most of my fitness equipment is basic and affordable. I find that my body weight generally gives me the best workout of all — and that is free, my friends! Gym membership: It’s funny. Years ago I would never dream of spending $100-plus a month on a gym membership, but now I do and it’s essential for me. I’d much rather skip the lattes and dinners out and spend my money on my Fit Pit gym membership. For me, the community, support and results (both physical and mental) are well worth the price tag. Shoes: The wrong shoes have given me issues from blisters to discomfort to all-out injury. Believe me, this is not the area to skimp on. SO worth the money — and taking the time at a specialty store to find what really works for you and your foot. Yoga mat: A basic yoga mat from Target will totally get the job done, but as I’ve done more and more yoga over the years, I’ve found that investing in a really good yoga mat is truly worth it. If you don’t, you end up replacing it every year or so — which adds up! Not to mention that the better quality mats have better cushion, don’t slip and generally just make yoga feel more awesome. I totally agree with all your saves and splurges. A nice gym that you enjoy is a must – in cities like San Francisco, this comes at a super premium of $160 plus, but it’s so worth it to me to not be in a crowded, depressing, cheaply furnished space. Trader Joes is heaven to me for organic veggies that cost less than some normal ones else where!